History of autoflowering, feminized and regular white widow marijuana seeds. White Widow is the classic amongst cannabis classics. This famous (or infamous, depending on your experience) hybrid strain is celebrated as one of the strongest available, a title she can still proudly claim after over 20 years and despite the recent explosion in marijuana research and strain development. White Widow has won numerous awards and parented many of the best loved strains ever bred. White Widow is a marijuana seed strain that has achieved near legendary status in the cannabis world. Every major seedbank offers its own version of White Widow, and it is hard to say which of the strains currently available are the “original”. In general, a White Widow strain is an Indica dominant hybrid with massive THC levels, topping 20% in some varieties. It can have anywhere from 50-75% Indica genetics, but no matter the genetic distribution the effects are powerfully Indica. Some strains have a pleasant, bright cerebral high, but all White Widows will sit you down with their heavy physical stone and powerful relaxing properties. While CBD levels are low in White Widow buds, this strain is a valuable medicinal option because of its narcotic and sedative effects. Yields vary widely with each breeder, with some claiming up to 800 g/m2 and others a more modest 300-400 g/m2. With a good White Widow strain you shouldn’t be worried about a smaller yield, because the bud is so powerful you only need a tiny bit to feel the massive effect. Many growers of White Widow claim they need to grow only 3 plants each year to support their personal stash because the smoke hits so hard. Because of her universal popularity and unbeatable effects, the creation of White Widow is claimed by many breeders. Everyone offers a version of this potent plant, and everyone would like to bask in the glory of being the first to breed her. White Widow was first released to the public under the name White Widow in 1994 from the Green House Seeds Company. White Widow is powerful, delicious marijuana. She was immediately loved and has greatly influenced cannabis breeding in the years following her release. The rest of the story varies considerably depending on which of two vehemently opposed camps you subscribe to. After much research, I have found little decisive, verifiable evidence to support either side. Instead there is lots of angry ranting from both sides against the other. Who is telling the truth? I will let you decide for yourself, though I do not believe we will ever know what really went on all those years ago. In the early 90’s a fellow by the name of Scott Blakey worked at Green House Seeds. Even simple facts about his involvement in the company are difficult to confirm. One story says he was co-founder and one of the original partners in the company. Green House founder and current company head Arjan claims he did not hire him until ’95, that he was not a co-founder but that he, Arjan, offered Blakey 25% interest in the company though his work was in sales and not breeding. But this is the Shantibaba story, so we will say he was there from the start and had his hands in the breeding program. The tale is this: Scott Blakey took the name Shantibaba, meaning quiet, quiet guru. His travels took him to Southern India, where he encountered a friendly local man who offered him a joint and later took him home to his village in the mountains. There he showed Shantibaba the Keralan cannabis that had been lovingly tended for years in his and other local villages to maximize resin production. Shantibaba was impressed with the potency and medicinal power of this hybrid strain, and took seeds back to Holland with him. Once home, he discovered the White Widow father plant amongst his Keralan seeds, and crossed it with a pure Brazilian Sativa, probably the landrace Manga Rosa or something similar, producing the very first White Widow plants. As soon as Green House released White Widow its popularity soared. It won the ’96 overall High Times Cannabis Cup and became an instant classic, influencing countless hybrid strains with its quality genetics. But there was strife back at Green House, and Shantibaba split from the company in ’98. With another previous Green House breeder, Neville, he went on to found Mr. Nice Seeds. Because Green House was already marketing White Widow under the original name, he renamed his strain Black Widow and continued to sell seeds bred from the original parents. To this day the only existing true White Widow parents are kept alive through cloning at the Mr. Nice Seeds bank. Black Widow is the only true original on the market, and all other White Widow strains are the result of breeding the progeny of the original plants. The Green House Seeds Company has a different story to tell. A dedicated cannabis breeder by the name of Ingemar accidently discovered the precursor to White Widow back in ’86 or ’87. The seeds were present in some charas, or hand rubbed hashish, the origins of which have never been revealed. Ingemar recognized the quality of the seeds and spent six years refining and stabilizing the plants. He released a young version of White Widow under the name Arnhem’s Wonder in the late 80’s. This strain won the High Life Cup in 1989. In 1992 Arjan purchased the Arnhem’s Wonder seeds from Ingemar, but says he made no further modifications, as Ingemar had already perfected the strain. When Green House Seeds opened they released White Widow and watched it become an instant classic. This story has developed further as an angry, accusatory and often downright nasty feud began to rage between the two groups, both claiming credit for breeding White Widow. Some claim that Shantibaba stole parent plants of White Widow when he left Green House. The seedbank states that it still has several clones of the original parents, and even that it stores clones in various places to prevent loss of original plants due to theft. We will probably never know the real origins of White Widow. A quick internet search will reveal the hatred and resentment felt by both sides, as well as the surprising number of supporters both parties have accumulated. It is unfortunate to see such a split in the cannabis community. Marijuana is powerful plant which many people believe can change the world. As a medicine it is constantly surprising users and doctors alike with its diverse applications. As a spiritual and recreational drug is brings peace and joy to many people. It is valuable for its fiber and its nutritional seeds as well as its psychedelic compounds. And yet despite its many beneficial qualities cannabis is still fighting for a legal place in homes, pharmacies and gardens around the world. The supporters of this magical plant should stick together and promote its life-changing qualities. After all, what kind of example do we set when marijuana users and self-proclaimed seekers of enlightenment and universal joy sink to attacking each other with angry vicious words and 20 years of hatred? In 1996, after the big High Times Cup win, Green House sold some White Widow seeds to Nirvana and Dutch Passion, both of whom released their own versions within a year. Paradise Seeds got early White Widow clones. Today most major seedbanks offer a version of White Widow, the characteristics of which vary considerably. There are numerous auto-flowering and feminized options as well. From her first honors at the ’95 High Times Cannabis Cup, White Widow has gone on to win numerous awards over the years. This list includes awards won by White Widow strains from various seedbanks, which will naturally have distinct characteristics. This list covers the main awards won by White Widow over the years, but it is not exhaustive. Some claim that White Widow has received over 25 awards from numerous cannabis celebrations. To check out more award-winning strains look at our Best Cup Winners page. It is not an easy call to identify the “real” White Widow strains, but here are four that we think are as close as possible. Green House Seeds offers a feminized version of White Widow these days. This is an easy to clone, fast growing and high yielding White Widow, with the powerful potency and hybrid high that made her famous. Those in the Ingemar camp will recognize this as the true original Widow. Green House’s White Widow grows well indoors or out, though it prefers mild temperate climates. Inside use SCOG to maximize yields. This strain regularly produces 800 g/m2 indoors, and can easily hit 900 g/m2 outside. The hit comes on fast and lasts a long time, beginning with a relaxing Indica stone that turns slowly into a bright, clear Sativa high. These are trusted partners to delivery fresh Green House – White Widow Feminised Seeds worldwide. Black Widow is the new name that Shantibaba gave to White Widow when he left Green House and started the Mr. Nice Seedbank. According to the seedbank, this is the offspring of the original White Widow parents, just listed under a new title. An easy to grow strain that needs a little extra flowering time to maximize resin production, Black Widow has all the qualities that won the High Times Cup in ’95. Shantibaba recommends this strain as a good starting place for the amateur breeder, stating the male plants especially make great parents for those new to making their own crosses. Shantibaba doesn’t offer exact ratios of Indica to Sativa for Black Widow, nor does he tell us the THC content of the strain. However users report extremely high potency and a powerful, lucid high. These are trusted partners to delivery fresh Mr Nice – Black Widow Seeds worldwide. Paradise received a White Widow clone and a WW male from Ingemar and Green House Seed Company back in 1996, right after the strain was released. The genetics of these plants influenced their breeding program over the years. In 2012 they chose to release seeds which they claim are as close to the original as you can get. In this instance, “original” refers to the original clone that Paradise received from Green House back in ’96. While this may not be exactly the Widow that won that first cannabis cup, odds are it is pretty close! One important distinction to note is that this plant has been feminized so obviously there has been some meddling with the original Widow genes. Original White Widow seeds produce a potent hybrid plant that is versatile and easy to grow under many conditions. Indoors she responds beautifully to many training techniques, including SOG, SCOG, topping and LST. Outside she stretches to nearly 2 meters and her yields increase. She can even tolerate the cooler, damper weather of more northern climates. While the bud is half Sativa, it is the potent Indica characteristics that shine through when you smoke Original White Widow. This is powerful weed that will catch even experienced smokers by surprise. These are trusted partners to delivery fresh Paradise Seeds – Original White Widow Feminized Seeds worldwide. Dutch Passion was amongst the first companies to get their hands on White Widow after her Green House release. They did some extra breeding on their own, but their strain hasn’t changed much since they first released it. Their seeds offer great consistency; the feminized version especially gives uniform production and very rarely produces hermaphrodites. Dutch Passion’s White Widow is an adaptable plant which takes well to indoor or outdoor growing, in hydro or soil. Some growers claim they can get a second harvest from their plants by switching the lights back to 24 hours a day for 3 weeks after the first harvest, then switching them back to 12 hours for a second bout of flowering. This strain can be left to grow a single large cola or topped to produce multiple buds, a system that works especially well with SOG or SCOG. The plants are sticky and resinous, and have all the kick the name is famous for. Most growers find they need to grow a lot less marijuana for their personal stash when they plant White Widow! It has a strong aroma when burned and will leave you feeling powerfully stoned. There are some bright cerebral effects, but the body high dominates. These are trusted partners to delivery fresh Dutch Passion – White Widow Feminised Seeds worldwide. Along with Dutch Passion and Paradise, Nirvana was one of the first to receive White Widow from Green House in ’96. They claim to still have one of the truest to original strains of White Widow available, which they offer in both regular and feminized form. The plants are of medium height but slender with delicate arms and moderately compact buds. This variety leans towards the Sativa side in both appearance and the high, which is energizing and social while being very powerful. A tip from Nirvana: decrease the lights to 8 hours a day during the last two weeks of flowering. This will stress the plant just enough to boost resin production. Like Mr. Nice Seeds, Nirvana does not share the exact percentage of THC in their strain or the ratio of Indica to Sativa genetics. These are trusted partners to delivery fresh Nirvana – White Widow Feminized Seeds worldwide. With the increasing demand for auto-flowering seeds, it is no surprise that many seedbanks are rolling out Auto White Widow varieties. These vary greatly in yield, flowering time and even in effect, though most retain the potency that the White Widow name is known for. Royal Queen’s auto-flowering version of White Widow has been happily received by growers. She is the result of a WW clone crossed with Royal Queen’s Critical Auto, with enough back crossed generations to ensure a stable, homogenous product. The appearance of this strain is strikingly similar to the original White Widow, with dark, wide leaves and a sticky white resin coating the buds. But she stays small and is ready to harvest just 3 months from germination. Thanks to her heavy, dense buds, yields are high for an auto strain. There is a lemon flavor in the smoke, and the stone is all heavy Indica. Expect a deep, powerful and physical effect that will ease your tension and melt the worries from your mind. These are trusted partners to delivery fresh Royal Queen – Automatic White Widow Feminized Seeds worldwide. Pyramid’s automatic version of White Widow is easy to grow and great for beginners or those with a short season. The plants are ready for harvest just 8 weeks after germination. Yields are high, though the 550 g/m2 seems a bit overly hopeful on the part of Pyramid. These plants do well in all set-ups, from soil to hydro, indoors or out. They do respond nicely to decent feeding with a little extra yield. The hit is has a nice hybrid spin to it. It starts out fast and hard with a soaring mental high that settles into a deep physical stone. These are trusted partners to delivery fresh Pyramid – Auto White Widow Feminized Seeds worldwide. White Russian is the cross of two famous strains, White Widow and AK-47. You couldn’t ask for stronger bud, with THC levels hitting 22%. White Russian performs best indoors, though it doesn’t matter if you use hydroponic set-ups or soil. The open structure and multiple budding sites of this strain make her ideal for SOG growing. Her mold resistance and ease of growing are rare among Widow offspring whose dense buds and heavy resin can leave them suceptible to rot. A clear member of the White Family, White Russian will provide you a bountiful harvest of heavily crystal coated buds. The high is a trippy cerebral experience with a sneaky body stone that may take your feet right out from under you. While White Rhino takes some of her genetics from her hybrid White Widow heritage, she is 90% Indica and powerfully Indica dominant in every way. White Rhino was originally bred by Green House Seeds, though a variety of seedbanks now offer versions of this popular strain. These are not all exactly the same however, for instance White Rhino from Dutch Seeds is only 55% Indica. Much like White Widow, it is hard to say who has the original Rhino. The Green House versión is a short, bushy Indica that flowers quickly and is easy to grow. She is true to her White heritage, with frosty THC crystals decorating every bud. With a powerful sedative effect and heavy body stone, White Rhino is a good choice for medicinal users seeking pain relief. This is another strain that carries controversy with it. In Green House Seeds catalogs it as Great White Shark, while Shantibaba claims it under the names Shark Shock or The Peacemaker. Either way, this is an Indica heavy strain that grows vigorously and produces big yields. The Shark strains are a blend of White Widow and Skunk #1 genetics, heritage that places this plant in a class all its own. This powerfully relaxing strain has numerous medicinal applications, and is widely used to numb pain, ease stress and induce sleep. Beware of the skunky smell in the grow room, this is not a choice for stealthy growers. These are trusted partners to delivery fresh Great White Shark Seeds worldwide. Despite the many claims by various seedbanks to the “original” White Widow, it seems that this plant has undergone nearly consistent changes since it first won the High Times Cannabis Cup in 1995. The various strains show differences in THC content, ratios of Indica to Sativa genetics and physical effects, though all these strains bear the name White Widow. There is no doubt that the White Widow genetics will continue to be altered through many breeding programs. We can expect to see more auto-flowering strains and certainly more offspring of White Widow crosses. 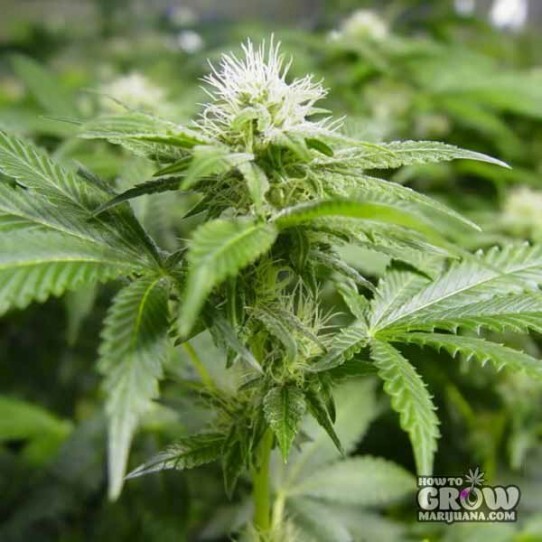 The high potency and ease of growth that are ubiquitous traits amongst White Widow strains and are highly desirable, making these great hybrids for the foundation of any amateur’s breeding program. If you are interested in developing new strains from the best plants in your grow room, consider using a White Widow male to pollinate your females. Regardless of the seedbank you choose, these are powerful genetics that will help you breed strong, potent plants. White Widow is relatively new on the scene as far as cannabis classics go. She is preceded by older foundation strains like Skunk #1, Northern Lights, Durban Poison and Hindu Kush. But the potency of White Widow made her a quick favorite and her genetics have spread far and wide since her ‘90’s debut. The ongoing battle for the title of “creator” of White Widow is an unfortunate testament to the vast success of these seeds. Hopefully the cannabis community can move on past the many differences of opinion and simply appreciate the merits of an incredible strain that has had an undeniable effect on modern marijuana strains. For those who see cannabis as part of their spiritual journey, letting go of the need to prove that “I did it first” is a great first step to freeing themselves of the ego and living the peaceful, loving life that marijuana encourages. Hey brah, I’m an old school guy who grow outdoors hack in the 70’s. Now trying to grow the feminized Ganesh outdoors, problem is they look like they will be 12″ little cola plants and not the 2m as advertised. Soil is a mixture of cow manure and good potting soil. They’re getting a good amount of diluted sunlight through a light tree canopy and watered in the morning and evening. I realize that’s vague, but any ideas as to why they are stunted? I’m thinking it may be a climate issue, but I haven’t gardened in many years. Any help would be greatly appreciated! Help! Peace brother. bro im from pakistan. can i find white widow seeds here and its cross for growing crystal mj..?? ?